Underdog – A CrossFit Open Experience by Emily H.
Hi, I am Emily H., a CrossFit beginner participating in The Open for the very first time! I was honored to be asked by Coach Lauren to chronicle and share my experiences throughout the challenges of the next five weeks. I am looking forward to sharing my thoughts and, most importantly, participating in this exciting event with the CrossFit Arx community I’ve grown to appreciate and admire very much. At the depths of my appreciation of CrossFit is the fact that there is always a place for the underdog, because your only competitor is yourself. I am absolutely, hands down, without a doubt an underdog! I’ve worked on seeking and refining my skills and strengths at CrossFit Arx since May 2017. I entered with no experience with the sport before that. The past nine months were an emotional journey for me after I made the decision to aggressively improve my health and mental strength after many years of ignoring the most important human responsibility of self-care. I quickly learned that the enthusiastic and supportive atmosphere is the infectious, driving force behind success at CrossFit Arx. It was also quickly apparent that not a single person overseeing my progress or working out next to me will ever give up on me in the ways that I so promptly give up on myself. One would think that a powerful dynamic like that would give a beginner enough courage to participate in the CrossFit Open, but if it were that simple I would not have waited until just a few weeks before to sign up. I’ve only recently captured the focus I need to accomplish the progress I’ve wanted to achieve since I started. After the sudden loss of my father on December 25, 2017, my entire mindset changed in realizing that true self-care is what requires courage and it was something that my Dad took very seriously throughout his life. It was not the movements, the skills, the breaths, and numbers, but the commitment to step up and accept where I was and where I wanted to be. While my commitment to promoting healthful change in my life was always apparent, the method was inhibited by self-doubt. And just like Goliath had to call out for David to step up to fight, an earth shattering yell changed everything for me. So, without this situation upon me I would have resisted all encouragement to participate in the CrossFit Open this year, but instead I’ve obliged and walked into the unknown prepared with the tools I’ve been taught as I watch this new and very large moving target! And while I feel excited, confident, and ready to embark on this new adventure and measure of what I’ve built on top of the foundations of nothing, I am also incredibly intimidated by the unknown. Signing up was easy, showing up on Friday night to accomplish the first workout is the scary part especially when you know that you have not yet developed the skills you need to accomplish the workout. Watching the announcement of 18.1 this evening was exciting and nerve wracking; it is a 20 minute AMRAP, 8 toes to bar, 12 calorie row, 10 dumbbell hang clean and jerks. 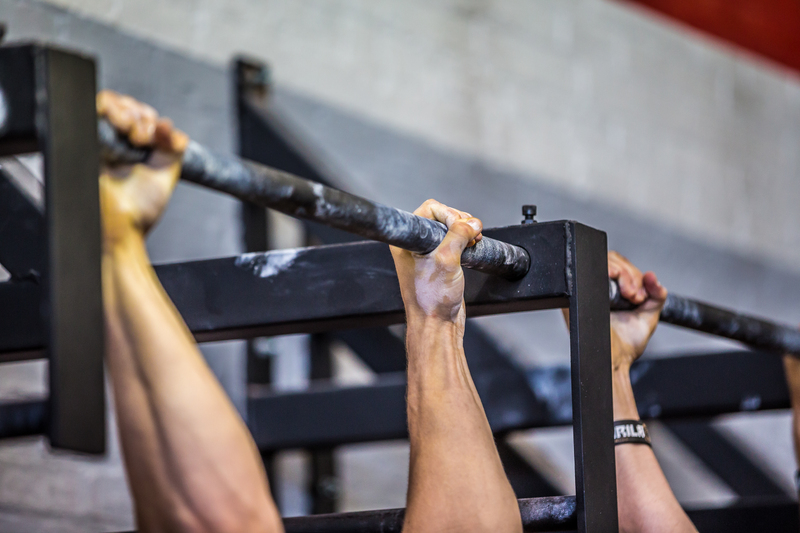 I will admit that my heart sunk when I heard that my very first workout in my very first CrossFit Open includes toes to bar. I am not even close to getting my toes to the bar. The scaled workout for Masters Women (35-39) replaces the toes to bar with hanging knee raises, but this is also a daunting challenge for me, especially considering the whole 20 minute thing. The length of the workout is very intimidating and will require focus, meditation, and some strategic thinking. I must resolve to remember why I started this to begin with and do my best to focus on this exciting moment to measure and test the better me than I was yesterday. Still, I have feeling it will be a sleepless night and day riddled with anticipation tomorrow. Hearts Don’t Really Exhale – A CrossFit Open Experience by Emily H.